Stephen has – alongside his parliamentary colleagues – cast a series of indicative votes to test the will of the House of Commons on a variety of possible Brexit options. Stephen voted in favour of five of the eight options put to MPs, including an option to revoke Article 50 to avoid No Deal and an option to hold a Public Vote. Although none of the eight options commanded a majority in the House, two came close. 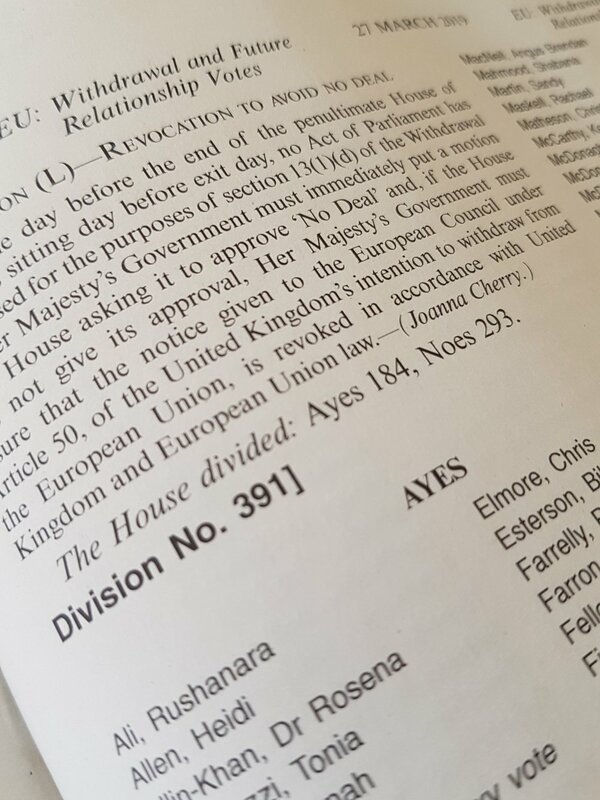 These were the proposal by Kenneth Clarke MP to keep the UK in a Customs Union (voted down by 272 votes to 264) and Margaret Beckett MP’s proposal to make the Prime Minister’s deal contingent on a public vote (voted down by 295 votes to 268). Speaking after the votes, Stephen said: “Although none of yesterday’s options got an overall majority, two have become front-runners; the Customs Union and the Public Vote. Both of these have significantly more support in Parliament than the Prime Minister’s deal. ”My preferred option is still a Public Vote and yesterday’s result shows that there is scope for this option being approved by Parliament. It is now time for the Government to put its deal to the people to break the Brexit deadlock”. A Statutory Instrument was also passed by the Commons yesterday, delaying Britain’s departure from the EU. If the Prime Minister’s deal is passed this week Britain will be set to exit the EU on 12 April, but failing this, Brexit day will be set as 22 May.